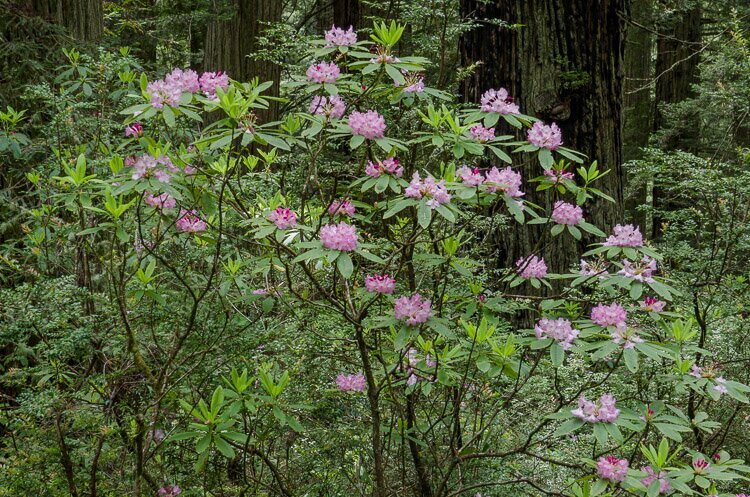 Every May on California’s northcoast Rhododendrons begin to bloom within the immense redwood forests that dot the coastal inlands in Redwood National Park. Curiously, this is considered the peak time for photography on in Redwood National Park. Most of the photography workshops that are scheduled for California northcoast arrive in spring, usually in May or early June, around the time the Rhododendrons are most likely to spread their purple petals. To see what all the fuss is about, I decided to go on up and check out the Rhodies blooming in the Redwood forests this year. The biggest clumps of them are in the Lady Bird Johnson Grove off Bald Hills Road (near Orick), and along the Damnation Creek Trail in the Del Norte Redwoods, right off Highway 101.